#1.3 Where to Put Your Gun Safe? Despite the criticism that many in the media display about gun owners, the truth is that the vast majority are intelligent men and women who know how to protect their firearms so that accidents do not occur. This is often done through use of the safe, and there are many great options out there for storing a wide variety of firearms, including window person has a number of them. Having a safe to store your firearms is a brilliant idea, but it can be a challenge to figure out exactly where to put a gun safe in your home. With a little bit of information you can make a more informed choice to maintain the security and safety you need for your firearm while also giving you access in an emergency. Owning is Only Part of the Solution! Access. While a floor safe or one that is in your basement may be a great idea, it may be quite difficult to be able to access it during an emergency. You want something that makes it easy for you to reach the safe when seconds matter, so ensuring that the location provides ease of access is vital. Stored Items. What you are storing also matters in terms of where you locate the safe. Many people store their jewelry or valuable digital media, items they may need to access on a regular basis. Having the safe in a location that is convenient for accessing these items is important as well. You may want to consider putting the safe in your office or in your bedroom depending upon what it is that you are most frequently going to retrieve from the safe. Environment. The temperature and humidity are also important factors. A safe that is located in a basement can easily become saturated with condensation, causing damage to your firearms, digital media, or documents. You want something that protects from water buildup, or that affords you the opportunity to place a dehumidifier in the safe or close to it. Weight. How much your safe weighs is also important. Many models can weigh as much as a thousand pounds or more, which may make it impossible for you to be able to store it in an upper floor or in the attic of your home. This will also play a significant factor in how accessible your safe is, as you want to ensure that the flooring is not damaged by a safe that simply weighs too much for the floor to be able to handle. While these factors are important, the truth of the matter is the reason you purchased safe is to keep burglars from being able to steal your valuables. This is why you want to take the right kind of steps to prevent anyone from even knowing that you have a safe and, if they do, that it is difficult for them to try to remove it. If you have a larger size safe, one that weighs hundreds of pounds, then theft is a lot more challenging. No one or two people are going to lift up the 400 or 500 pounds safe to get out of your home. However, you should take the proper precautions to make it so that it is still difficult to remove. This means that the location in your home should allow you to be able to secure the safe in place, either in the floor or in the wall. Where to Put Your Gun Safe? Now that you have some general information about what to look for in terms of location, temperature, weight, and other factors, some general locations in your home of where exactly to put your safe are in order. A Bedroom or Den Closet. A closet is a great place to put any sized safe. It is likely that no one will know that you have a safe in your closet, but it is also easy to camouflage it. By placing clothes, blankets, and other items in and around the safe, it up secures the ability for anyone to find where the safe is that. Plus, it is still easy to access in an emergency, especially if you are in your den or bedroom. In a Wall. There are many great wall safes out there that would be ideal for your home. Most come with depths of no more than a few inches, so they can easily fit in almost any wall in your home. Plus, they give you the added security of secrecy, as you can easily cover these with a painting or other object you hang on the wall. The Floor. There are also great safes that you can place into the floor of your home. Of course, if you live in an area with high humidity this can be a concern, as moisture can build up in the safe causing damage to your firearms and other valuables. However, there is no denying that a floor safe provides you excellent protection from detection. A Cabinet. 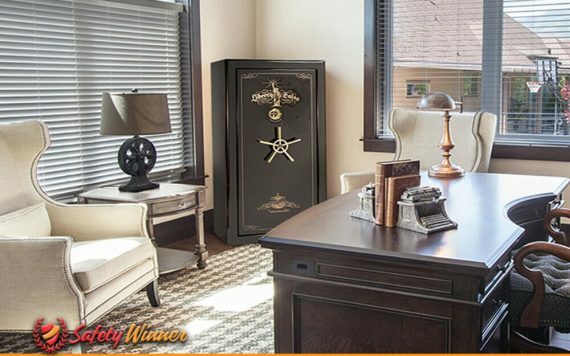 If you have a small hand gun safe, this safe can be put in almost any place in your home. However, a cabinet is often a great location simply because you can place it among a large assortment of items. Your silverware, dish set, napkin holders, and other items you would place in a cabinet can easily camouflage your gun safe. While there are many locations for a safe in your home, these are some of the best. Consider that the average burglar is pretty intelligent and knows where to search for valuable items such as firearms. Using these places can be the ideal location to deny a thief the ability to steal your firearms.